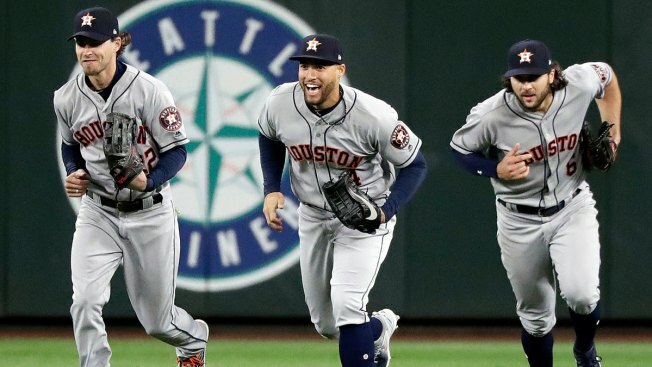 In this April 17, 2018, file photo, Houston Astros outfielders Josh Reddick, left, George Springer and Jake Marisnick race to the infield after they defeated the Seattle Mariners in a baseball game in Seattle. Houston outfielders have been celebrating victories this season by doing dances inspired by the "Fortnite Battle Royale" video game. Forget Fenway Park — David Price and the Boston Red Sox are feeling every bit at home at the Flush Factory. And in Houston, George Springer and the Astros are just as likely to be talking Boogie Bombs as balls and strikes. Why is Xander Bogaerts making an L with his fingers and dancing on second base? Who's the Ninja on Phil Hughes' Twitter feed? What's with Derek Fisher and llamas? Just like gamers everywhere, major leaguers have fallen hard for the "Fortnite" craze. And while it's not how John McGraw would teach teamwork, Port-a-Forts and Slurp Juice may be the biggest thing bonding some big leaguers. "We play all day, every day," Springer said. "Fortnite Battle Royale" is perhaps the world's most popular video game, and baseball players are among its most voracious players. The game pits up to 100 competitors in a last-man-standing scenario, letting them mine materials from an ever-shrinking map while hunting down enemies with a variety of weapons. Working in teams is often critical, which is how the World Series champion Astros ended up with a 12-man crew which plays almost nightly at the team hotel on the road. Springer and Houston's other outfielders have even been celebrating victories by performing dances from the game — the trio forms a circle, throws their hands in the air and quickly moves their feet, a move "Fortnite" apparently adapted from an episode of "Seinfeld." Bogaerts was doing something similar on opening day, celebrating a double by doing the "Take The L " dance — a popular "Fortnite" taunt. The Red Sox have a "Fortnite" squad that covers an array of ages. The 32-year-old Price was a little late to the game — he heard teammates talking about it near the end of spring training and privately tested it out before trying to break into the team's Playstation rotation. He practiced a bit with J.D. Martinez, a former Tigers teammate who signed with Boston as a free agent this winter, then got into melees with reliever Carson Smith. "We play together at the field, at the hotel on the road or at home whenever we get home from the field," Price said. "It's something that's kind of taken over." Craig Kimbrel, Chris Sale, Matt Barnes and Eduardo Rodriguez have helped them round out a regular "Fortnite" crew. Sale even bought himself an Xbox just to play the game. "Everybody's kind of in on it," Barnes said. "It gives us something to do outside the field. It's fun and we're still hanging out." Barnes spoke while watching Rodriguez play "Fortnite" in the Fenway Park clubhouse before a game. He and Sale provided commentary on Rodriguez's battle — at one point, Barnes cut off the interview to warn "watch it Eddie." Turns out, hypercompetitive men in their 20s and 30s make the perfect audience for the 100-person showdowns. And at least in Boston, it's been great at bringing players together off the field. "It is," Martinez said. "In a weird way, we all play video games, but we play with each other." Even the sport's aging veterans are getting in on the act. That includes 34-year-old Dustin Pedroia, an elder statesman among the Red Sox. "I personally haven't played with Dustin, but I understand he's in the mix," said Smith, supposedly the best player in Boston's clubhouse. "He's starting to figure it out." Hughes, a starting pitcher with the Minnesota Twins, legitimized his "Fortnite" credentials in January by beating Ninja, one of the top "Fortnite" players in the world, and posting video of it to Twitter. Meanwhile in Houston, Jake Marisnick is the unquestioned king of the Tilted Towers, though Alex Bregman isn't far behind. Fisher, on the other hand, might be the most entertaining. "Fish is loud," Springer said. "Especially if he finds a llama. Don't let Fish find a llama." "Don't let me find a llama," Fisher confirmed. The craze has gone far beyond baseball. "Fortnite" was a hot topic around the Final Four, and Toronto Maple Leafs star Auston Matthews says he rarely leaves his apartment on days off because he's so consumed. Indiana Pacers player Lance Stephenson wore custom "Fortnite" shoes during a game this month, and NBA stars Ben Simmons and Karl-Anthony Towns have even connected with fans by live streaming their Battle Royales. Live streams of "Fortnite" and "PlayerUnknown's Battlegrounds" — a similar game, often referred to as "PUBG" — have become a fascinating insight for fans into the lives of their favorite athletes. Tens of thousands of people have tuned into Simmons' sessions on Twitch, but it's not just superstars drawing eyeballs. Brewers minor leaguer Brett Phillips has had thousands of people view his Twitch feed, which has included cameos from friend and former teammate Lance McCullers Jr. of the Astros. Phillips' Triple-A teammate Tim Dillard has even gotten over 30,000 views on a "Fortnite" parody video starring former big leaguer Quintin Berry filmed around the Colorado Springs clubhouse. The next time one of those Sky Sox crack a big league roster, they might find life isn't so different between the minors and the majors. "It's just a bunch of dudes playing video games," Springer said. AP writer Tim Booth and freelancer Ken Powtak contributed .